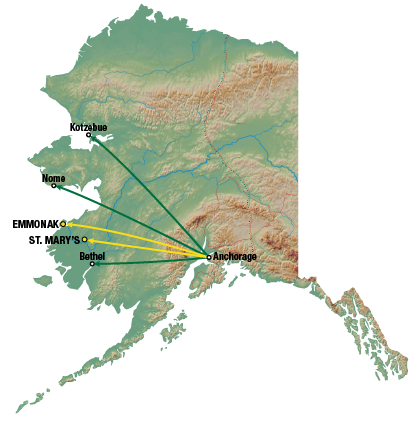 Lynden Air Cargo is expanding its scheduled service points in Alaska to include St. Mary’s and Emmonak. Beginning April 30, Lynden will offer year-round scheduled air freight service on Tuesdays and Fridays to better serve customers and to support local industries in the Western Alaska region. “We have traditionally served these areas with charter service to support seasonal fishing operations, but we are now proud to offer regular and reliable airfreight service all year,” says Lynden Air Cargo President Rick Zerkel. “Lynden Air Cargo has been delivering freight in Alaska for many years, and we know the challenges and terrain. We handle oversized loads and small packages alike with our scheduled service and flag stops to points in the Alaskan Bush. We can arrange the right flight to get cargo delivered to practically any village or city in the state.” Lynden Air Cargo’s scheduled service to St. Mary’s and Emmonak will begin and end in Anchorage. 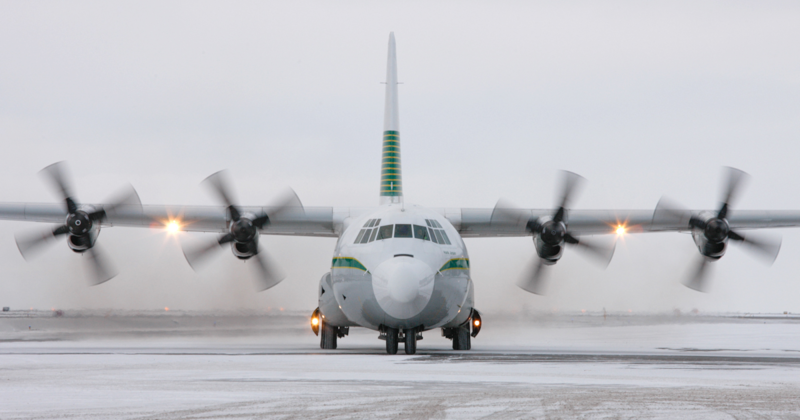 In addition to fish and general cargo, Lynden will carry bypass mail in and out of the two areas in its commercial C-130 aircraft. 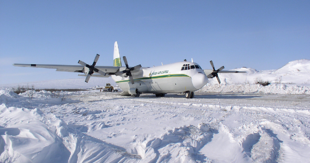 Lynden Air Cargo also offers scheduled year-round service from Anchorage to Bethel, Nome and Kotzebue and flag stop service to other remote points in Alaska. Flights to Bethel are scheduled Tuesday through Saturday and to Nome and Kotzebue on Tuesdays, Thursdays and Saturdays. More information on these services can be found at www.lynden.com/lac, or by calling 907-243-7248. Lynden Air Cargo has increased its presence in the world market to include places like Papua New Guinea, Africa, and Antarctica. Because of its unique capabilities and its close proximity to Canada and the Northwest Territories, Lynden has been successful delivering oversized cargo to remote mining operations throughout the region. Last year, Lynden Air Cargo received the Alaska Governor’s North Star Award for its long history of assisting in humanitarian relief and environmental disasters worldwide. Lynden was recognized in the Transportation and Humanitarian Exchange categories and was one of only four companies to receive the honor. For more than 30 years, the Governor's North Star Awards for International Excellence have recognized Alaskan companies and organizations engaged in successful international business and activities. Lynden pioneered service to Alaska in 1954 and today serves customers in every sector of the Alaska economy, including energy, mining, seafood, retail, military and government. Lynden Air Cargo’s fleet of aircraft supports multi-national oil and gas exploration and production companies on Alaska’s North Slope through weekly scheduled flights and oversized cargo worldwide through charter flights. 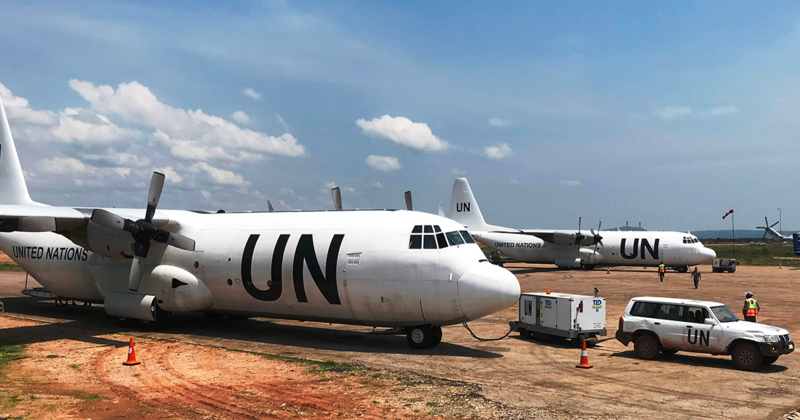 Lynden aircraft have responded to fires, earthquakes in Haiti, supported a peacekeeping mission in the African Congo and, most recently, mobilized relief flights to help those affected by Hurricanes Irma, Jose, and Maria in the Caribbean. Lynden Transport’s steady and consistent efforts at improving efficiency and reducing waste have paid off with real savings for the company and the environment. 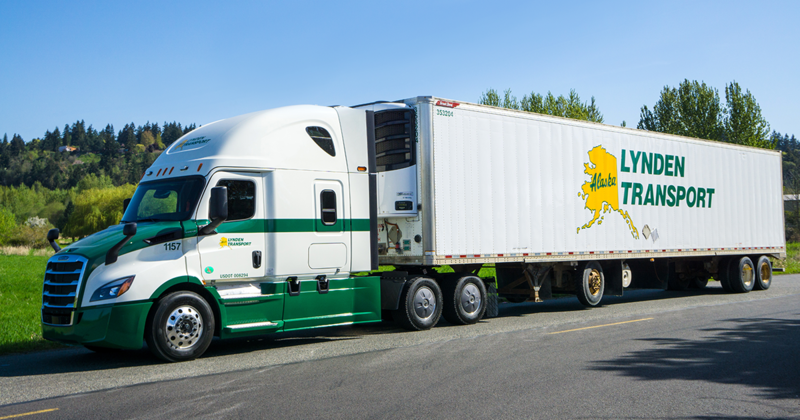 In 2008, Lynden Transport was the first and only trucking company in Alaska to join the SmartWay Transport Partnership and to earn the Green Star business award. Over ten years later, the company continues to improve and to see the results of these efforts. 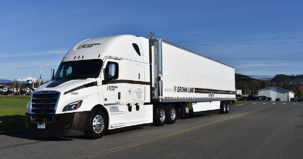 "We started in 2008 with a complete re-evaluation of our line tractor specs for aerodynamics and reduced weight," explains Charlie Mottern, Lynden Transport Director of Maintenance. "With these changes we were able to dramatically improve our fuel economy and have continued to improve on these specs incorporating design elements into local and regional applications." "Our trailer design maximizes payload and cube for the lane that it travels," he continues. "We have used heated and refrigerated trailers and all electric and electric standby for over 30 years. Wide-based tires and side skirts have been added in lanes that are best suited for those enhancements." These changes have led to a substantial improvement in efficiency and emissions reductions. 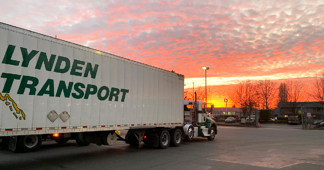 Since 2009, Lynden Transport has improved freight efficiency (measured in grams of CO2 per ton mile of freight moved) by 29 percent, miles per gallon by 43 percent, and reduced nitrogen oxide and particulate matter emissions by 63 percent and 81 percent respectively. "We also work to reduce the time trucks spend idling by working with drivers and using automatic shutoff in areas where it isn’t a safety hazard," says Dallas Freeman, Director of Line Haul and Equipment. "We are partnering with the state to test hydronic heaters on our local trucks which allow us to shut the trucks off in extreme temperatures. Throughout the company, we have reduced the average truck idle time per truck by nearly 14 percent in the last five years." Small changes add up to big savings in other areas as well. Nearly 20 separate energy efficiency upgrades at Lynden Transport’s facilities have led to an overall 37 percent reduction in natural gas use and 18 percent reduction in electricity used. The Anchorage Service Center replaced all exterior lights with efficient LEDs resulting in a 30 percent reduction in electric use in the past 10 years. "Each year we pick a project, replacing old lights, adding motion sensors, repairing insulation. We even removed the lights in the vending machine," says Richard Hennagin, HSSE Manager. The Anchorage facility also cut its heating needs by over 50 percent by investing in automatic thermostats and insulated dock shelters. The shelters prevent heat loss around the trailers when they are parked at the dock for loading and unloading. Lynden will continue to strive to operate in the most efficient manner with the highest regard for the health and safety of our employees and protection of the environment. Each year, LTI, Inc. honors its Everyday Heroes with dinner events at various locations in Washington, Oregon and Idaho. Retirees are also included to celebrate employees past and present for their many years of dedicated service to Lynden. Milky Way Driver Scott Polinder achieved a milestone of 40 years of safe driving in 2018, and Jeff Smith celebrated 30 years without an accident. Retirees from the past year Jeff Kok, Arnie DeKubber and Mark Coppinger were also recognized for their years of service. 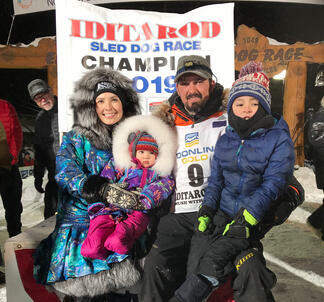 Lynden is proud to congratulate Pete Kaiser for finishing first in the 2019 Iditarod race. Pete is an employee of Knik Construction, part of the Lynden family of companies, and counts Lynden among his team sponsors. In a close race heading out of the White Mountain checkpoint, Pete skillfully guided his team the final 77 miles to the finish line in Nome. He finished with a time of 9 days, 12 hours and 39 minutes. This is the tenth time Pete has competed in the Iditarod. “We are all very excited for Pete and enjoyed tracking his race this past week. Pete’s grit and determination show the world what it means to be a proud Alaskan,” says Jim Jansen, Lynden Chairman. "Pete is not only a great employee for our company, but his passion and dedication to his work shows in his mushing as well. We are excited for his accomplishments and look forward to more races in the future," says Dan Hall, President of Knik Construction. In addition to the Iditarod, Pete regularly competes in the Kuskokwim 300 dogsled race. He holds the record for most consecutive victories in the Kuskokwim 300, winning four times between 2015 and 2018. He placed second earlier this year in the 2019 race. 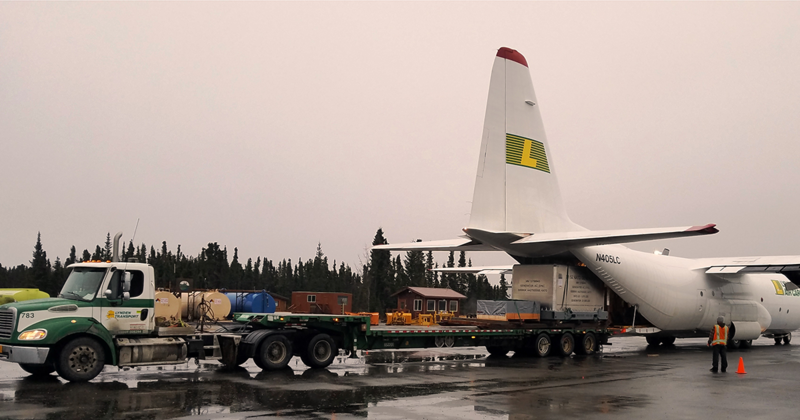 Lynden Transport and Lynden Air Cargo recently completed a joint move with a customer to transport a generator valued at $1 million from Kenai to an oil field near Prudhoe Bay. The photo was taken on the tarmac at the Kenai Airport and shows a winch being used to secure the generator onto the plane. "We usually do these types of moves a few times a year from Kenai and deliver to various sites in Prudhoe Bay," says Kenai Service Center Manager Andy Collins. "The moves often consist of very high-value pieces of equipment such as turbines or generators. They move via air due to the value and delicate nature of the cargo." The Lynden crew picked up the generator at the customer's warehouse using a 53-foot step deck trailer which provides a smooth air ride and the perfect transfer height for the rear door of the Hercules aircraft. 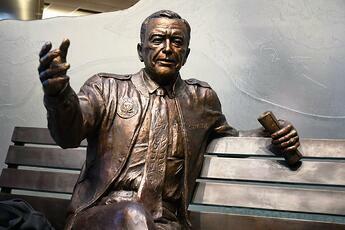 According to Andy, Ralph Hemphill was the driver on this project. "He did an outstanding job," he says. "The move was completed without a hitch. 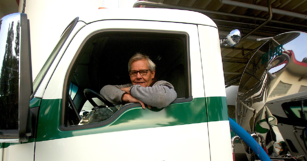 We also would like to give kudos to Lynden Air Cargo Loadmaster E.J. Peters for his help."